Actually, entire books have been written about keywords, but the subject is still poorly understood or not grasped at all by many. It is not possible to build a successful online branding strategy, or SEO strategy without proper keyword grounding. Keyword research is an essential part of any SEO strategy. Let’s take a little time to make some definitions. A keyword is a significant or descriptive word, one that is used as a reference point for finding more information. Keyword research is the work you do to come up with a list of keywords for which you wish to rank. A key phrase is a group of words that conveys an idea, an answer to the search intent. 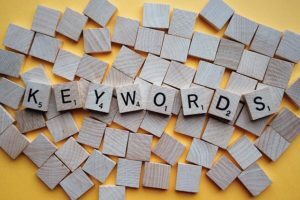 In most SEO strategies, the terms keyword and key phrase can be used interchangeably; they mean the same thing, but a multi-word key phrase is often the more useful tool. The presumed intent of searching for the word, “senate” has changed. It will keep changing, too. If you were the searcher, a more productive key phrase might be, “senators from Florida” or “Florida Senators,” which yields a SERP (search engine results page) headed by images, biographies and articles about Florida’s two United States Senators (what you really intended)..
Search intent is the art and science of discovering what a searcher actually wants and supplying it. It is not about just keywords, but the underlying reasons for the search. A search for “football” issued in Europe will give very different results from the same single word search originating from Atlanta, Georgia. However, if a German citizen visiting Atlanta was to enter the key phrase, “European football,” he or she would probably come much closer to the desired result. Keyword research is critical; you must make certain that the search terms your target audience use match as closely as possible the key phrases you include in your branding strategy and SEO techniques. Do not try to be ‘cute’ or to overthink the audience. It is a common mistake to use one set of words or phrases when describing a product or idea while the target audience uses a completely different set of words. The website cannot be found by their potential customers because of a mismatch in word use. Here is a practical example – You are a rental agent for a group of lakefront vacation homes. One of your associates has described these houses as “adorable bungalows.” That phrase sticks in your mind and you begin to use it as part of your branding strategy and as a keyword/key phrase in your SEO strategy. “Adorable bungalow” might be a good term for a 19th century novel, but it is not a term that most people use when trying to find a good vacation rental. You are not going to rank. There are actually professional people who spend a good deal of time in determining what keywords or key phrases are used at a specific time of year, for a particular occasion (a wedding or a vacation), in a given geographic location or by a defined ethnic group. This kind of research requires access to paid databases and the skill needed to use them. If you are a small business person, a professional practitioner or service provider, your best bet is probably an informal poll of friends and associates. Just ask them, “How would you try to find a (name your service or product) in this town?” The most common answers you get from a moderate number of associates and acquaintances will most likely be your best keywords. That is good advice, but if you do not have the time or inclination to do keyword research of any type, it will pay you to turn to a professional search engine optimization company and internet marketing agency. Axiom Administrative Services has the professional digital marketing skills needed to guide your web presence to the rankings it should have. Axiom understands the needs of small businesses, professional practices and nonprofits. Please visit Axiom’s small business services or call Axiom at 800-888-6348.